What if . . . we think about architecture as no longer being defined by permanence? If instead we see impermanence as a default condition of cities? Flexible architectural configurations are temporarily deployed around the globe, to provide medium-term shelter, often to enormous crowds. Such structures fulfill a range of functional tasks and are used in religious and cultural festivals or can take the form of markets, military camps, refugee camps, or even temporary mining towns. This magazine is published on the occasion of the exhibition Does Permanence Matter? 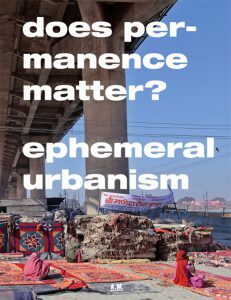 Ephemeral Urbanism, held in the Architekturmuseum of the Technical University of Munich at the Pinakothek der Moderne, based on a long-term study by Rahul Mehrotra and Felipe Vera. The research traces a global phenomenon that has become increasingly topical given today's current state of mass migration triggered by climate change, political strife, and natural disasters.